ionCube is a PHP module extension that loads encrypted PHP files and speeds up webpages. It is commonly required for PHP-based applications. 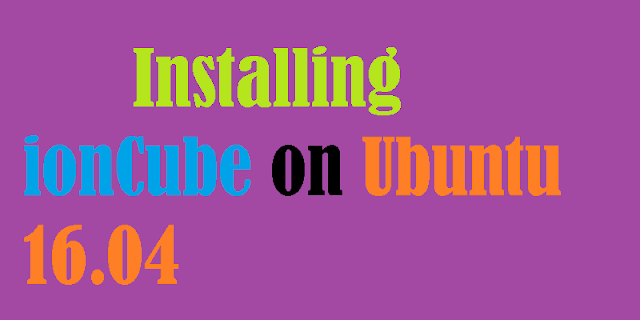 This article will guide you through the steps to install ionCube on a Ubuntu 16.04 server. To follow the steps mentioned in this guide, you will need One Ubuntu 16.04 server with a sudo non-root user and a web server with PHP installed, such as Apache or Nginx. If it is 32-bit or 64-bit. If you have a 64-bit Ubuntu server, you are probably running 64-bit PHP, but let's make sure. To do so, we'll use a small PHP script to retrieve information about our server's current PHP configuration. Create a file called info.php file in the root directory of your web server (likely /var/www/html, unless you've changed it) using nano or your favorite text editor. We're running 7.0.8. x86_64 64-bit PHP; if it ends with i686, it's 32-bit. With this information, you can proceed with the download and installation. Go to the ionCube download page and find the appropriate download link based on your OS. In our example, we need the this 64-bit Linux version. Copy the tar.gz link on the site and download the file. This creates a directory named ioncube which contains various files for various PHP versions. Choose the right folder for your PHP version. In our example, we need the file PHP version 7.0, which is ioncube_loader_lin_7.0.so. We will copy this file to the PHP extensions folder. To find out the path of the extensions folder, check the http://your_server_ip/info.php page again and search for extension_dir. For PHP to load the extension, we need to add it to the PHP configuration. We can do it in the main php.ini PHP configuration file, but it's cleaner to create a separate file. We can set this separate file to load before other extensions to avoid possible conflicts. To find out where we should create the custom configuration file, look at http://your_server_ip/info.php again and search for Scan this dir for additional .ini files. So, we'll create a file named 00-ioncube.ini inside the /etc/php/7.0/apache2/conf.d directory. The 00 at the beginning of the filename ensures this file will be loaded before other PHP configuration files. Paste the following loading directive, then save and close the file. For the above change to take effect, we will need to restart the web server. You may also need to restart php-fpm, if you're using it. Finally, let's make sure that the PHP extension is installed and enabled. It confirms that the PHP ionCube extension is loaded on your server. It can be a bit of a security risk to keep the info.php script, as it allows potential attackers to see information about your server, so remove it now. You can also safely remove the extra downloaded ionCube files which are no longer necessary. ionCube is now fully set up and functional.